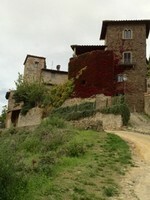 Ed and I recently spent a week in a guesthouse in the Chianti region of Tuscany. We were finally able to take advantage of the guesthouse for which we bid and won at a V Foundation silent auction. The week at the guesthouse was donated by cancer researcher Dr.Olja Finn (at the University of Pittsburgh) and her husband Professor Emeritus Dr. Seth Finn at Robert Morris University in Pittsburgh. They restored the all-stone guesthouse, originally a farmhouse attached to a (deconsecrated) Catholic church with a bell tower. Such a charming home away from home! We spent the week cooking pasta with Seth in his kitchen or ours (unfortunately Olja was back in Pittsburgh), eating at some great restaurants like Antinori-owned Osteria del Passignano and Ristoro del Lamole, reached from a very winding road with a great view of Chianti. Of course we visited wineries to experience Chianti Classico wines, like Ca di Pesa, near our guesthouse in San Martino and owned by Jonathan Auerbach, Chief Strategy Officer at Pay Pal in NYC. Our favorite winery experience, however, was at the amazing new Antinori in Bargino, which has English-language tours and a restaurant. Upon arrival, we walked up a dramatic winding staircase to see the very contemporary buildings and vineyards. Little did we know that both the vineyards and buildings were situated over the winery, which is built into the mountain 16 floors below. The cellar structure was conceived to allow the grapes to move with the flow of gravity from the top floor down to the fermentation tanks, eliminating the need for mechanical pumping (protecting the grapes) and the need for refridgeration, as the grapes and wine are cooled naturally by the soil surrounding the cave. The beautiful winery was designed by Archea Assocati Studio, enginering by Hydea, and took seven years. We began our tour with a film about the Antinori family and winery. Marquese Piero Antinori, the current proprietor of the winery, can trace his family history back six centuries to 1385, when his ancestor Giavanni di Piero Antinori enrolled in the Wine Guild of Florence. (We actually met Piero at a Napa Vintners Association Auction, when we sat at the same table with him.) 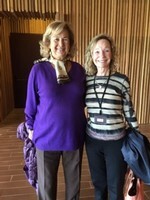 This time, we were lucky to have his wife, Marquesa Franchesca Antinori sit with us at the film and then accompany us on our tour of the winery. We tasted some delicious Villa Antinori Chianti Classico, Marchese Antinori Chianti Classico Riserva and Vinsanto del Chianti Classico, and learned as we did at other wineries in Chianti that the Sangiovese grapes are rarely blended with other varietals in order to capture the uniqueness and freshness of the region.